Find out how diamonds capture the exquisite beauty of dazzling lights. The diamond has long been synonymous with love. Rare and unique, they have become a symbol of timeless devotion for couples in love. Colour, Cut, Clarity and Carat, or the four C’s, is the universal method for assessing the quality of diamonds. Understanding this universal diamond language will enable you to work confidently with your jeweller to create the perfect ring. However, the 4C’s do create an arbitrary and oversimplified measure of a gemstone's quality. While it’s a widely accepted way to measure stones, Sutcliffe strives to do more, finding the best among the grades to ensure the gemstone you receive is the very best available. Every gem is unique. Some are more unique than others. A diamond comes in many shapes and sizes, from tear drops to heart shapes, pear shapes and emeralds. But when we refer to the cut of a diamond we're not talking about the shape. We're talking about the quality of the cut. A diamond’s cut is what enables it to transmit light and sparkle so intensely. 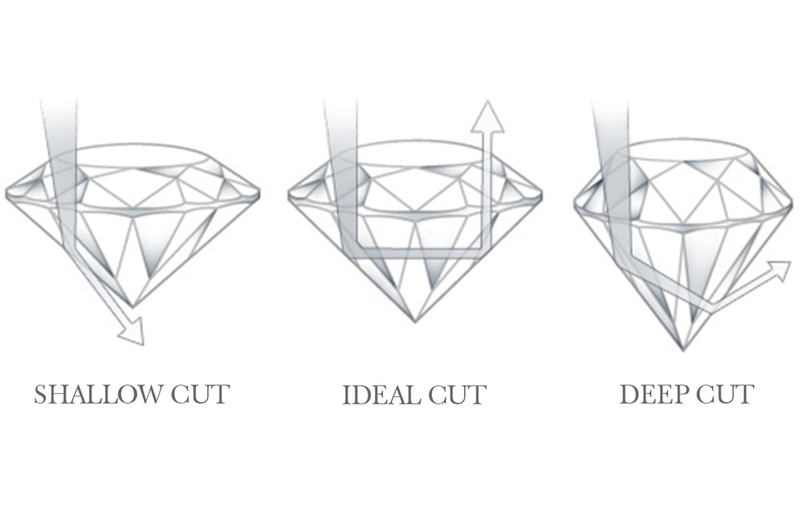 A diamond’s cut grade is actually about how well the diamond’s facets interact with light. Precision and artistry are required to unveil the maximum sparkle of each stone, fashioning it so it’s proportions, symmetry and polish return and unleash the beauty of light. Fire: The scattering of white light into all the colours of the rainbow. We will step you through these measures to ensure that the gemstone you purchase is the very best available. When evaluating the colour of a diamond, we are in fact looking for the absence of colour. A chemically pure and perfect diamond has no colour or hue. This also gives the stone a higher value. The D-to-Z diamond colour grading system measures the diamond’s colour by comparing a stone under controlled lighting and precise viewing conditions to master stones of established colour value. This colour grading scale is the industry's most widely accepted grading system. The scale begins with the letter D, representing colourless, and continues, with increasing presence of colour, to the letter Z. Many of these colour distinctions are so subtle that they are invisible to the untrained eye; however, these distinctions make a very big difference in diamond quality and price. The clarity of a diamond is determined by the absence of inclusions and blemishes. Natural diamonds are the result of carbon exposed to tremendous heat and pressure deep in the earth. This process can result in a variety of internal characteristics called 'inclusions' and external characteristics called 'blemishes.' While no diamond is perfectly pure, the closer it comes, the higher its value. The Diamond Clarity Scale has six categories, some of which are divided, for a total of 11 specific grades. Very Slightly Included (VS1 and VS2): Inclusions are observed with effort under 10x magnification, but can be characterised as minor. Caratis the measure of a diamond's weight. A metric "carat" is defined as 200 milligram’s. Each carat can be subdivided into 100 'points.' This allows very precise measurements of your diamond (to the hundredth decimal place). When discussing your stone with the jeweller, they may describe a diamond below one carat by its points. For instance, a diamond that weighs 0.25 carats may be described as a twenty-five pointer. Diamond weights greater than one carat are expressed in carats and decimals. Note, image may not be to scale. The larger the diamond, the rarer it is. So, as diamond carat weight increases, so does the diamonds value and price. However, two diamonds with the same carat weight can have very different values, due to the remaining 4C’s.